Rare and hard-to-collect seeds are important repositories of genetic diversity. 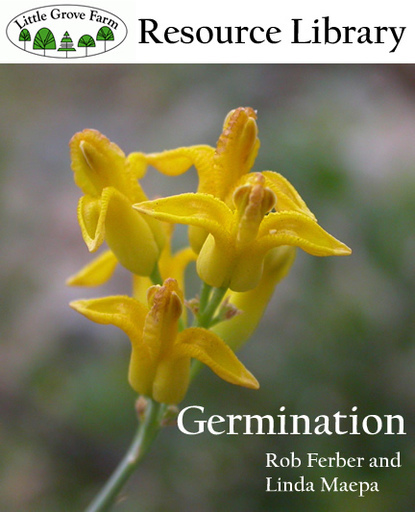 Germination is Little Grove Farms' guide to successfully germinating wildcraft-harvested seeds. Copyright © 2013 Little Grove Farms. All rights reserved. Congratulations on selecting some of the most rewarding and beautiful perennials from the California landscape! Now, the trick is germination and seeing them to flowering. 1. Plant in the Fall or Winter (if you haven’t started them by March, put them into the refrigerator over the Summer and plant them in late September or October – Scoliopus can be planted anytime, however). 3. They can be direct and simply sprout when planted (Scoliopus is a good example) have no tricks – at most, they wait until the pots are chilled by the cold of Winter before germinating, but many will germinate rapidly when watered, without waiting for other triggers. Some species can require patience – Trillium usually show their first leaves in the second Spring after planting (these seeds germinate a root the first year, then a leaf the second Spring – the young seedlings should not be disturbed until after their second leaf growth cycle or third growth year). Here is our recommended protocol for starting this group. Understand this is an experimental procedure, and your results may vary based on variables we do not discuss in this document. These instructions are written as if a 4” pot will be used to start the seeds, but this is just the smallest pot size that we recommend for the starting of bulb seeds – use larger pots if desired, or troughs. Put a bit of window screen scrap over the drainage hole(s) in the pot. If there are multiple holes or if this presents origami-like challenges, use ¼” orchid bark and put a layer of this into the bottom of the planting container covering no more than the bottom half inch. Obtain clean (free of mud and silt) 30 grit or finer (80 grit is good, 120 grit is ideal) silica sand, if possible, otherwise any sand that is relatively free of silt and mud and lumps will do. Using a scoop (any empty small container, such as a cleaned, empty pint can), measure one volume of sand into a 5 gallon mixing bucket. Obtain peat moss (compressed is usual). This will need to be broken up and fluffed, and all the lumps broken apart. I usually sift it through a very coarse colander or half inch hardware cloth. Using the same measure as above, press the sifted moss into the measure to pack it in, and measure one measure of the moss into the mixing bucket. If you can find them, add two measures of dry Douglas Fir needles, or any other small fir-type needles (I get them by sweeping my driveway). Alternatives include composted oak leaves or any other mildly acid, highly fibrous composed plant matter. Screen it as in (b), then compress it lightly into the measure as in (b), and add to the mixing bucket. This needs to be free of weed seeds. Optionally add half a measure of either agricultural grade pumice (best), pearlite (works well), or vermiculite (water less often if you use this). Moisten the mixture with a bit of water, and without kicking up dust, mix it thoroughly by hand or with a small trowel until uniformly mixed. If you want to be extra-thorough, sift the material through the screen again as in (b) and (c) to break up lumps from wetting the material and to thoroughly mix it. You now have a high quality seed starting compost for perennial/summer growing lily seeds from most parts of the world – we’re still looking for a tidy name for this group, such as summer-growing year-round moist geophytes.